Growing up, one of my all-time favorite things to do was spend the night at my grandparent’s house. My grandma and I would sew, take a ride in the golf cart, and have tea parties. My grandpa would buy me ice cream and take me to breakfast after church on Sunday mornings. Whatever sports game he was watching would blare throughout the house, and every time I smell Listerine, I think of my grandpa. He has a green comb that he keeps on a side table next to his recliner. My grandma has a violin hanging on a velvet backdrop across the room. My grandparents have lived in this house my whole life, and it’s still one of my most comforting, happy places. At these sleepovers, my grandpa would always go to bed super early, and my grandma and I would watch a movie on their old, boxy TV that always had the color off-balance. Each time, my grandma and I would make popcorn before watching My Fair Lady or whatever new cartoon had just come out on VHS. Usually, we would just make the microwavable, bagged kind, but one night when we didn’t have any, my grandma pulled out an old, yellow popcorn popper and some kernels in the back of the pantry. 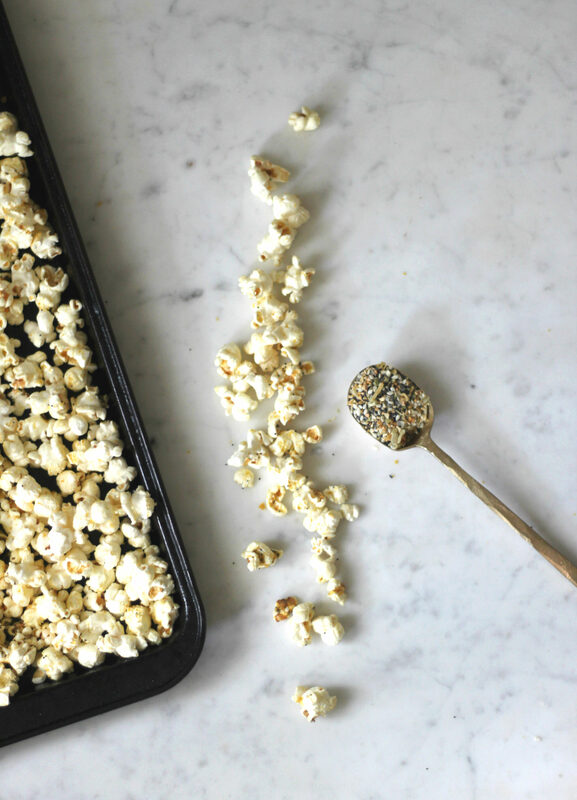 We had hot, buttery, salty popcorn, and it was life-changing. From then on, we only had popcorn from that machine. Eventually, my grandma gave me that popcorn popper, and it’s the one I still use today. You know the episode of How I Met Your Mother where Ted has a coffee-maker named Shocky that always zaps him when he plugs it in? The Popcorn Pumper is my Shocky. It’s not quite as bad as Ted’s, but it definitely sparks a bit when you plug it in, and all of the pieces fall apart if you just breathe on the machine, so it’s kind of like playing Jenga every time you make popcorn. But it’s my favorite thing in my kitchen, and I will keep it until it just doesn’t go anymore. According to a quick Google search, it was made in 1978, so I think it’s here to stay. Last night, I ate popcorn for dinner. I came home from work, and there were no groceries in the fridge, and I had eaten my last leftovers for lunch. I had two options: go to the grocery store (not likely) or scrounge up whatever I could. I found an array of veggies, some nutritional yeast, popcorn kernels, and a container of plain Greek yogurt. After eating all the veggies I could manage in order to make me feel like a grown up, I decided I only had one choice: popcorn for dinner. Plus, I had that nutritional yeast, and I have heard time and time again that it goes swell with popcorn and gives it a “cheesy” flavor. And it’s good for you, so healthy cheesy popcorn for dinner is ok?!?! Also, I added everything spice, because when don’t I add everything spice? The savory, cheesy flavor from the nutritional yeast combined with the everything spice actually tasted like a bagel which is all I can really hope for in life. I made a big batch, cuddled up on the couch, and watched movies while the rain drizzled outside. Bell slept next to me, pausing from her naps to take an occasional bite of popcorn. I thought of my sleepovers with my grandma and grandpa. It was perfect. 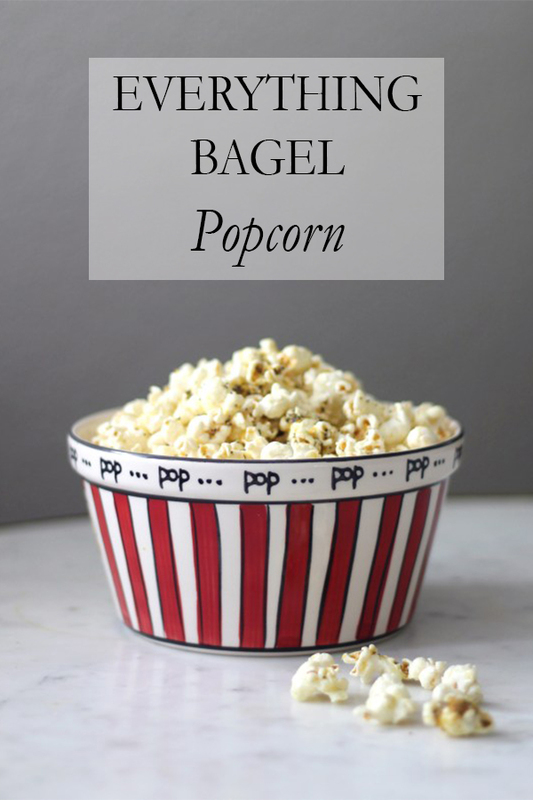 For this recipe, I used onion powder and garlic powder rather than the dried versions so it would stick to the popcorn and make it more flavorful. Feel free to use whatever version of garlic/onion spice you have. Nutritional yeast can be found at health food stores, although I've found it in the bulk section of my local grocery. I've heard the more powdery the better, but I use whatever I can find. You can also replace the oil with coconut, canola, etc., but I like the flavor of the olive oil. Pop your popcorn kernels using a popcorn popper (ssl today was brought to you by the letter 'p'). Alternatively, you can do it over the stove by heating 2 Tbs. of oil in a large soup pot. Add a couple of kernels. Once those pop, add the rest of your kernels, cover with a lid, and shake the pot over the heat until the kernels pop about 2-3 seconds apart. Immediately remove from heat to prevent burning. 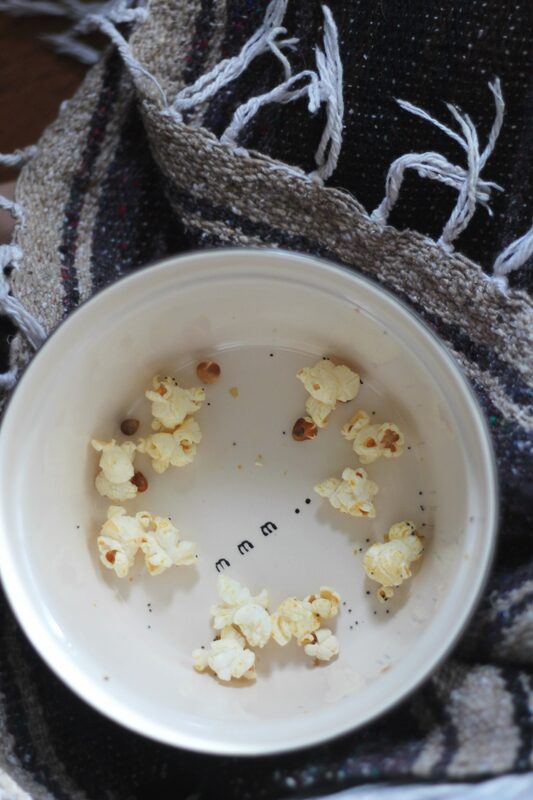 Place popcorn in a large bowl or container with a lid. While the kernels are popping, combine the olive oil, nutritional yeast, garlic powder, onion powder, sesame seeds, and poppy seeds. It will be pretty thick. You can add more olive oil if you want, but it's not necessary. Immediately pour the olive oil mixture over the popcorn. Cover the bowl or container with a lid, and shake it well to coat the popcorn. Season with salt, and shake again.